This AIP Tropical Protein Granola is the perfect grain free, AIP, Paleo on-the-go snack! It’s nut and grain-free, sweet, salty, and perfectly crispy. 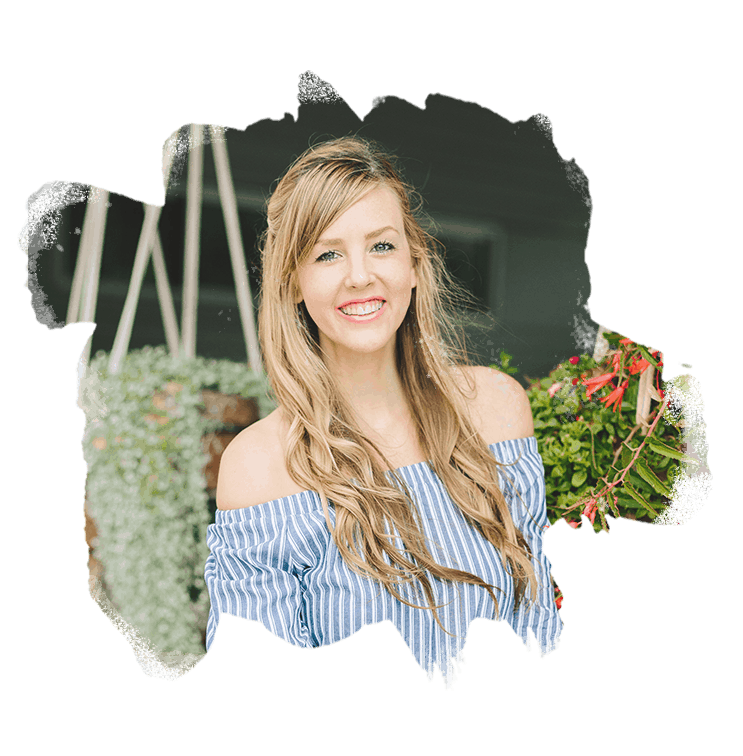 Gluten free, Autoimmune Protocol, and Paleo friendly! This recipe is hands down the most frequently created recipe in my household. My husband and I go through at least two batches a week! 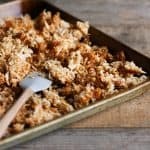 I’ve made a Cinnamon Toast version (included in my free Paleo Cookie Exchange ebook), a Pumpkin Spice version, and now that the weather is warmer, I put together this Tropical Protein Granola version. I have to say, this might just be my favorite. James and I eat this protein packed granola by the handful, or in a bowl with coconut milk and additional cinnamon sprinkled on top. With the added protein from the collagen, you can pair it along side my Perfect AIP Matcha Latte (also boosted with collagen) for a filling, antioxidant rich breakfast, or have it stowed in your purse in a Stasher Bag for a quick AIP snack. I also love munching on it after dinner as a dessert. I recently took this Tropical Protein Granola with me on a mother/daughter trip to California, and my non-AIP eating mom was in love with it! The only suggestion she had was to add more nuts, as she had assumed the sliced tigernuts were actual nuts ;). Psst… I put together a free ebook to help you transition to AIP like a total rockstar. Want some help in rocking your AIP transition? You can have my free ebook containing protocol specifics, an enjoy + avoid list, a dining out guide, and even some (not so average) meal planning tips. Download your free copy below! I’ve tested this recipe with half the maple syrup and it works just as well, but I prefer the slightly sweeter flavor of the recipe as written. I’ve also tested this recipe with honey, and while the flavor is AMAZING, the thicker honey makes it difficult to combine. Use the honey substitution at your own risk. Fair warning, the Vital Proteins Collagen Peptides makes this granola have a bit of a sticky texture while it’s raw, so wait until it’s baked and cooled before you dive in head first. Chop apricots, pineapple, and tigernuts into bite sized pieces. In a large bowl, combine coconut, collagen, apricots, pineapple, and tigernuts. Add maple syrup (1/8 -1/4 cup depending on personal preference), cinnamon, ginger, turmeric, and sea salt. Stir with a rubber spatula until the coconut and fruit are well coated. Spread out on a parchment lined baking sheet, and bake for about 13-15 minutes, stirring after about 7 minutes of baking time. 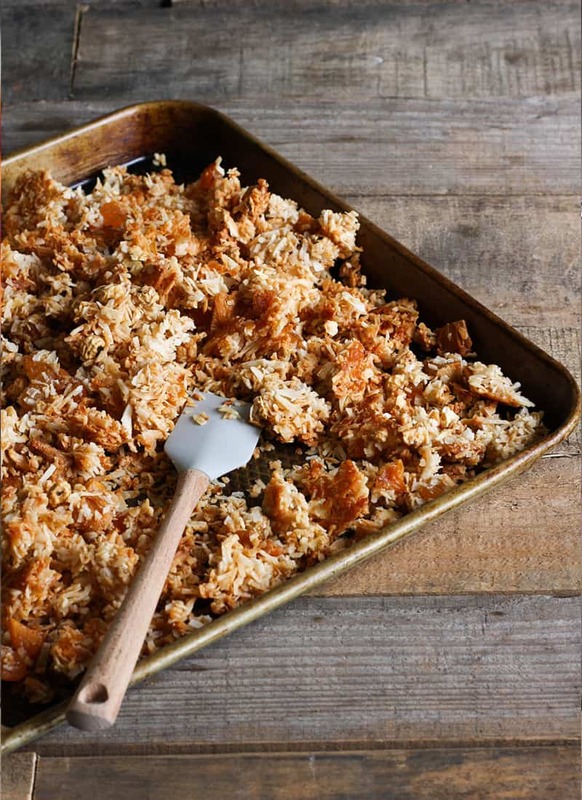 Remove from oven when the coconut flakes are golden brown. Let cool on baking sheet. 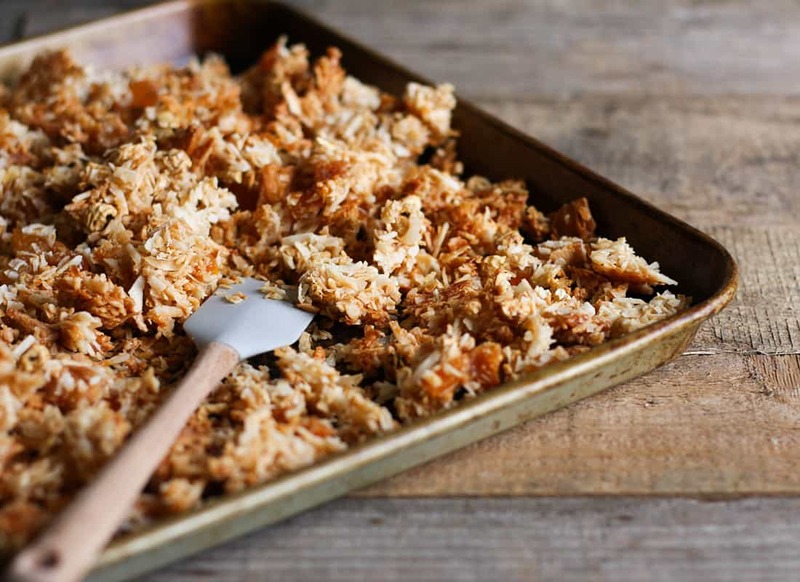 The coconut flakes will crisp and form larger clumps as they cool. 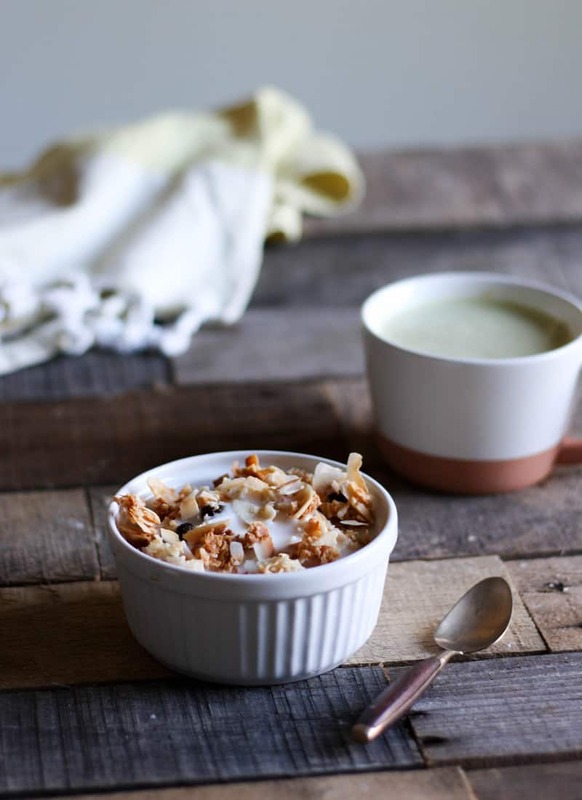 Enjoy as a handful of granola, or in a bowl with coconut milk and an extra sprinkle of cinnamon. Great Lakes brand collagen can be substituted for the Vital Proteins brand. For Great Lakes, use 1/4 cup. This was easy and really good! (only downside is it’s obviously high in sugar) I didn’t have dried pineapple so I subbed dried cherries. I noticed the directions don’t say when to add the collagen. I think it’s obvious to add it in step 4, but someone might miss it entirely since it isn’t mentioned. Also, curious how you store this- fridge or pantry? And, how long do you think it is good for? I have another granola recipe that I use cherries in. Love that combo! Thanks so much for pointing out the collagen, I’ll fix that now. 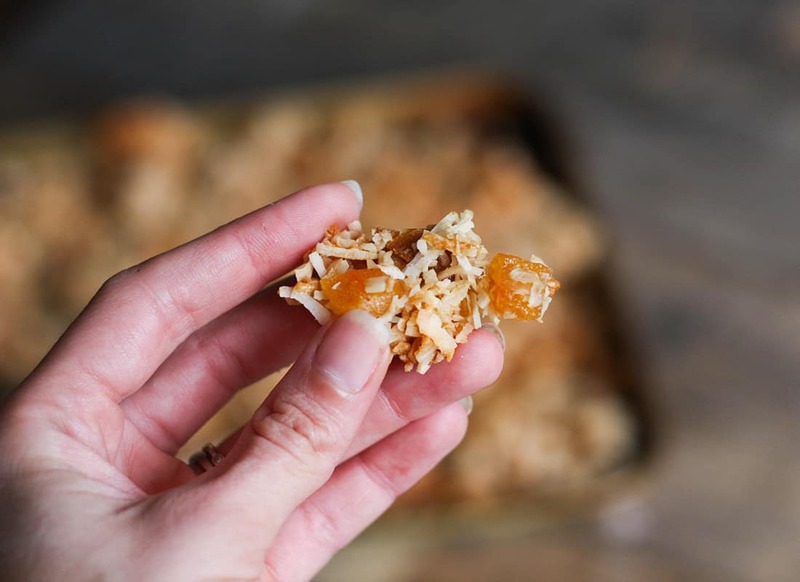 If you’d like to lower the sugar, it’s still delicious just by replacing the dried fruit with flaked coconut. But the fruit makes it feel a bit more fun. It still isn’t very clear on when to add the collagen. I added it with the spices into the maple syrup. I didn’t have any dried apricots so I used jumbo raisins and it’s delicious, thank you!!! I’m not sure what happened, but the collagen is included in the instructions now. Thanks for pointing that out! I’m glad you tried and liked the recipe! I am on a low oxalate diet to control kidney stones. Do you have any info on the oxalate content of tiger nuts?